There is a current “debate” as to the value/need for weapon training in Aikido and its importance. Our dojo follows the training curriculum from O’sensei’s personal dojo in Iwama, Japan as laid out by his longest serving student, the late Morihiro Saito Sensei, and as taught and continued by Saito’s student, Saburo Takayasu Sensei, 7th dan shihan. The practice with the bokken (wooden sword) and Jo (wooden staff) is integral to our practice of Aikido as passed on by the founder of Aikido, Morihei Ueshiba. If you watch this video, you will hear Stanley Pranin, the editor of Aikido Journal, and a long time Aikido practitioner and researcher, explain why. There is a tradition in Iwama that whenever someone who trained there for any significant length of time goes back home, a sayonara party is held for him (or her). A part of the tradition is to treat the person to a sayonara nikkyo, in which two people apply nikkyo to his wrists so that he can’t tap out. Of course, care is taken to make sure that he is not actually injured. Some people say that I invented the sayonara nikkyo. I don’t clearly remember, but it’s probable that in its basic form it existed before I set foot in Iwama. But I did invent a humorous twist to it. 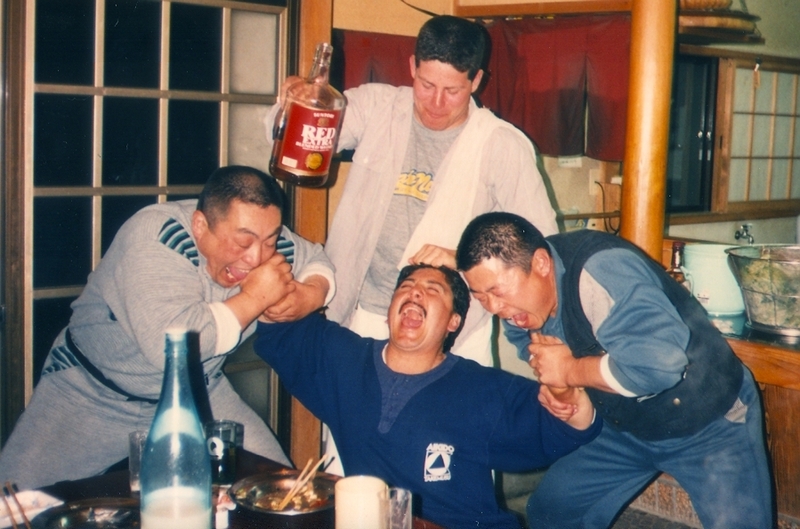 At one party I was observing someone enjoying their sayonara nikkyo and, on impulse, picked up a bottle of Suntory Red whisky (the official dojo drink which we called “Iwama nectar”), and poured some into the recipient’s mouth. Everyone thought it was very funny, and it caught on and became part of the ritual. How much better can it get; receiving refreshing stimulation to both wrists while enjoying delicious Iwama nectar? I first went to Iwama to study in 1980. It was at my own sayonara party at the function centre on Mt. Otago that Saito Sensei personally selected David to be one of the executors of my “double-nikkyo” – I still remember it – fondly! Here is a later photo (from 2000) recoding the practice in Iwama with Hitohiro Saito Sensei (right), Kenichi Shibata Shihan (left) and with Miles Kessler skilfully handling the genuine Suntory Red whisky bottle. The practice of nikkyo still holds an important place in my dojo. I first went to Iwama and met Saito-sensei in the spring of 1972. I was training at the Aikikai Hombu Dojo in Tokyo at the time, and heard stories about this “outdoor dojo” in Iwama and a legendary sensei named Saito who was teaching the classes there. Saito-sensei was scheduled to teach Sunday morning classes at Hombu, and I went every Sunday in hopes of meeting him. But he never came. So, it seemed that I had to go to him. My wife and I went to Iwama and ended up in the six mat room at the entrance to the dojo. Saito-sensei and a few other people were training. After a while Saito-sensei came over to us and asked if I wanted to train. I said yes. He asked if I had a uniform. I said no. He said “Wait a minute”. He went to his house and brought back an old uniform. I put it on and bowed into the class. My first training partner turned out to be the resident monster whose name was Shigemi Inagaki. The first technique was shiho-nage. The first time he threw me, he did it so hard that I hit my head on the mat and was knocked out for several seconds. When I woke up, I thought to myself, “This is what I’ve been looking for”. We stayed for several days in Iwama, and slept in O-Sensei’s old storeroom next to the dojo (which was subsequently demolished to build the current “red room”). It was a very interesting place, filled with books and old charts of Kotodama symbols that O-Sensei used in his lectures. We wanted to move to Iwama as soon as possible, but there was no housing for us. I commuted to Iwama from Tokyo a number of times over the summer and participated in numerous gasshuku (seminars) with university students and other groups. Particularly challenging was one with Isoyama-sensei and his students from the Air Self-Defense Force base at Iruma. Saito-sensei finally arranged to have a house built for us, and we moved to Iwama in the Fall. We ended up staying for about 10 years. Also known as Kihon (basic) it is what builds the foundation of tai-sabaki (body movement) and kokyu-rokyu (abdominal breath power). Like bamboo bending in the wind,the Yawarakai level emphasises the principle of awase and requires the defender to give in resiliently to deflect the attack in a direction that he can merge into the movement and take control. Yawarakai technique is intermediate between Katai and Ki-no-nagare. In Ki-no-nagare technique, the defender does not wait for the attacker to obtain a grip, but begins merging into the attacker’s movement before contact is made. Saito-Sensei explained in his book, Traditional Aikido Vol. 5, on page 36 that: “Aikido is generally believed to represent circular movements. Contrary to such belief, however, Aikido, in its true Ki form, is a fierce art piercing straight through the center of opposition”. For Alexander Sensei’s full article see Levels of Technique in Aikido Training. “After training under a good teacher for several years, it is possible to develop “Kokyu ryoku” (loosely translated as “abdominal breath power”). “Most trainees do not get Kokyu, especially if they omit “Katai” (rigid) training and practice “Ki no Nagare” (flowing style) exclusively. If many of them are grabbed with strong power, they can’t even move. On the contrary, in Iwama in the 70’s, getting Kokyu was almost a given. For someone with good, clean technique and Kokyu Ryoku, he or she is able to perform a technique effortlessly against a strong person who is resisting with full power. This is real Aikido, and would make O-Sensei proud. So, this is my definition of elegance in technique; “Effortless against full power”. For more of Alexander Sensei’s interesting anecdotes, see Iwama wisdom. Some years ago, when struggling to gain insight into how to powerfully perform morote dori kokyu nage (the basic form practised at the start of every keiko) I cam across an article by Koichi Tohei in Aikido Journal (Vol. 24, No. 2 1997). “In 1940, Mr. Shohei Mori introduced me to Ueshiba Sensei and I became his student. I was terribly impressed with the way Ueshiba Sensei would throw people without any strength at all. I went to the dojo for every practice, but I found that I couldn’t even measure up to the high school students who were training there. After a while, however, I noticed that whenever I came to aikido practice completely exhausted after a session at the Ichikukai, nobody could move me. I also noticed that when I threw people while in that exhausted state, they would really go flying. These two phenomena made me realize that the trick was to let go of strength. On the other hand, Ueshiba Sensei was always telling us to use strength in the techniques. So I experimented in various ways with both using strength and then letting it drop away, then using it again and so on. … At that point I realised that relaxation was an important key, although I also noticed that there were things that I could not do simply by relaxing. I felt that the reason must be something I was doing wrong. … When I returned from the war, I found that whereas Ueshiba Sensei could throw me very easily, other people’s techniques were completely ineffective. There was obviously some difference between the two applications of technique. Others said that it was simply that Ueshiba Sensei had ‘the strength and skill of a thousand men,’ but I wondered if it were really true that despite both of us being human, Sensei could do and I could not do. … It was around that time that I discovered Tempu Nakamura Sensei. He taught me that ‘the mind leads the body’. The mind is the upstream and the body is the downstream. If the upstream is muddy, so will be the downstream. From Nakamura I learnt that unification of mind and body is possible through purifying the mind and allowing it to influence the body. I had already experienced this on the battlefield, but I had not connected that experience with this principle. I think the same can be said of aikido. Looking back on what Ueshiba Sensei did, it is clear that he would apply his techniques only after leading his opponent’s mind. By contrast, we were all trying to lead our opponents’ bodies, and then trying to figure out how to throw them. Naturally they would resist and become impossible to throw. Aikido is difficult to learn – the path is long and winding. As with many endeavours one constantly struggles with levels of understanding. Each achievement leads to further questioning and uncertainty. Don’t be square, be hip! When entering or turning which move first, the hips or the feet? The movement of the head determines the movement of both hands. Both O’Sensei and Saito Sensei emphasise the importance of initiating our moves with the hip. Not only do we start with hip rotation but we finish with a hip thrust. Do not lead with the feet but with the hip. Students often say, “why is it important to do the technique ‘precisely’ surely everyone is different – we can do it in our own way”, or particularly for westerens “near-enough is good enough”. There is a saying that the slightest deviation renders a technique renders a technique ineffective. There is no need to conduct basic exercises with undue speed. Care should be taken not to leave out the cardinal points of the exercises and form a peculiar habit as a result of too hurried an approach. You are advised to follow faithfully the “Kuden” (Secrets of Aikido orally bequeathed by the Founder), which casts light on these cardinal points. AJ: The precision needed for blending is a valuable point. “Saito : Anyone can blend in a general sense, but one should begin with more specific forms which will ultimately expand to the universal harmony the founder spoke of. First you learn how to blend with your partner “toe to toe ,” then how to pivot on your front foot. When you know how to pivot properly you will be able to execute an urawaza technique. One cannot express these things verbally; they can only be mastered by training. The founder said, “Practice comes first.” It is not that your partner blends with you, but that you should blend with him in everything: “Move, open, then take the lead. ” This is what O-Sensei taught Saito Sensei. A mistake of one centimeter could make it impossible to execute a technique successfully. You can’t change the technique willy-nilly to suit yourself. There is a definite way to do each technique. Anyone, not just the physically strong, should be able to apply the techniques. Unfortunately, people neglect tai no henko. I can tell by watching people practice tai no henko and morotedori kokyuho what kind of practice they have been doing at their dojos. I do not need to see more. I think all the basics of the founder’s taijutsu are contained in these two techniques and ikkyo. It is hard to find anyone who is able to execute a perfect ikkyo technique. I know this may sound insolent, but I think you cannot understand aikido without starting properly from these techniques. Why sweat the small stuff – because it matters! In 1974 Saito Sensei wrote in his forward to Volume 3 of his book Traditional Aikido Sword Stick and Body Arts that he had quoted “the words bequeathed by Founder Morihei Ueshiba which represent the heart of techniques”. Sensei Derek Minus has asked that these secret oral teachings or Kudan be recorded for those students without access to these invaluable books. First published in 1974 by Minato Research & Publishing Company, Tokyo, the cited page numbers will be from the 12th printing, July 1981. Saito Sensei in expressing this Kudan would say, lower the kata (shoulder), hiji (elbow), koshi (hip) and kimochi (spirit). Saito Sensei next considers the basic forms of Ikkyo through to Gokyo. Saito Sensei then gives the kudan for the standing forms. This, he explains, is the way to meet your partner”s force. Thus a large step by your partner should be equalized by a small step from you. If this needs further clarity he has given us the belief of O Sensei that, “True Budo knows of no opponent nor an enemy. True Budo aims to form a wholly integrated entity“. (p.21 vol 3). Saito sensei gives a reminder that your hands must stay in your centre – in front of your navel.